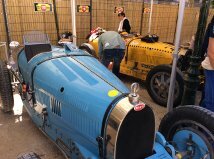 Maria and Dickie Bird, sent me these photographs from the famous “Circuit des Remparts” race weekend. 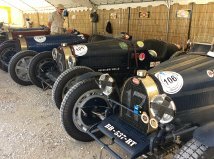 (France) The weekend normally in September each year includes concourse competitions, an international tourist rally through the picturesque French countryside, as well as a whole day of vintage and classiccar racing around the historic walled circuit in the old town of Angouleme. Chas Longhurst, our Vice-President and Events co-coordinator has written a review on the trials and tribulations of taking a Classic car to the ITV station. 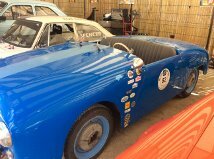 Like all cars driven on the road classic cars need to pass a technical inspection. A number of checks are carried out on the vehicle to make sure that it is safe to drive and road worthy. If your classic has ordinary plates, then it will need to be inspected annually. If it is on historic plates, then the date of inspection depends on the age of the car and can be either 5 or 3 years. To get historic plates. Firstly, your car need to pass an extensive ITV inspection which is more expensive than a standard ITV. However, ITV inspectors are aware that historic cars can hit the road in their original way, so they only check the basic safety points on the car. As with many things in Spain, the process is a long drawn out affair. I will look into the process/requirements and post an update here as soon as I find any more information. For now here is Chas experience. During the middle of February this year I took my Triumph Vitesse for its first ITV inspection. (In my ownership) With Judy’s help we booked an appointment online with the ITV station in Vera. My Vitesse is on Historic plates, and only needs an ITV every 3 years. (See above) Young Bill kept me company as this was my first visit with a classic car, and I am sure that he would find the experience interesting if not entertaining. Upon entering the tunnel, unlike an ordinary car the Vitesse was not subjected to an emission test, nor seat belt verification. The next step was to compare the commission plate number with the chassis number. (On which it failed) For the life of me, and through lack of knowledge I could not locate the chassis number. The next stage, was the full external lights inspection. A task in Itself-Full beam, dipped, sidelights, indicators, reversing and brake lights. My car does not have fog lights or hazards but, the inspector did not question this. Followed, by the brake test, both hand and foot. Fortunately, both these passed by 110% so much so that the car shot off the test roller-backwards-whilst still beeping horn! Then onto the torture test-the rolling road. This tests the car’s wheel bearings and general tracking. (Which, again the car failed) The rear offside wheel bearing was not up to standard. That was it-my poor car left the testing station with a ‘Not passed with documentation on its failure points. With a historic car. The ITV station gives you 3 months from the date of failure to re-test without further charge. So six weeks later with two new wheel bearings on the back wheel (Thank you Bill) I also went aimed with a Triumph Vitesse owner’s manual in both English and Spanish, this proved helpful to ascertain the whereabouts of the elusive chassis number-much to the inspector’s satisfaction. Fantastic-the car passed its ITV on its second inspection. So that’s it for another 3 years. So if you are taking your Historic/Classic car for an ITV here are a few tips. 3. If you don’t speak Spanish-take someone with you who does. ITV stations (Inspección Técnica de Vehículos) in Almeria. To book an appointment online. Address/Opening Times/ITV stations in Andalucía.